The Froggy Match-it app now has eleven levels and covers a lot of the phonics taught in schools. There are now matching, graded, writing sheets to go with each of these eleven levels. These worksheets are completely free, making the whole Froggy Match-it package extremely good value and a really useful resource. The writing sheets are simple to download from the website: click here to see them. They consolidate the work the children have done at each level of the app and encourage accurate spelling of phonic words in sentences as well as giving handwriting practice. 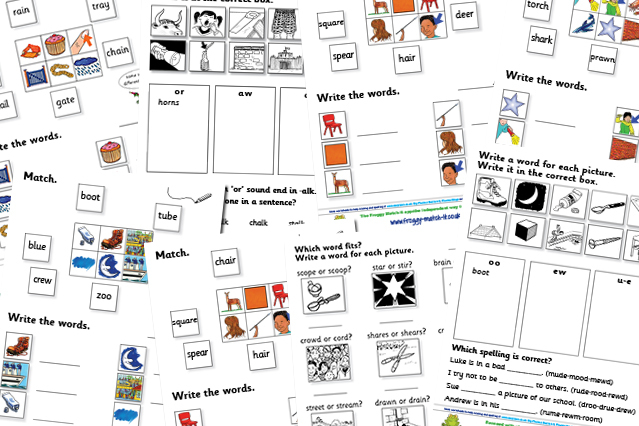 Most sheets can be completed by children independently and they are ideal for homework and revision. Levels 9, 10 and 11 deal with alternative spellings for phonemes/sounds. For example, level 9 looks at words with long a, e, i, o and u vowel sounds and the different ways to spell them: words such as rain, tray and gate. If you like the Froggy Match-it writing sheets, please tell your friends and colleagues about them.